POLICE car: we need this in our lives! Then buy it from him... no? Re: POLICE car: we need this in our lives! Wow thats a pretty cool video. Giving a few pointers to that man could do too. His cockpit model is so detailed CE could make cheap cinematics with little camera work and lighting (e.g. his cockpit opening gif). Rest of the hull can be made bulkier then. Most of the work would be already done. Thanks Queadah for the video, it's pretty interesting! This would feel too much like Wipe'Out", wouldn't it? imho if we have police cars, they should be the same kind of cars as the ones we drive ingame (ok everyone has understood by now that i don't like 3 wheeled cars^^). I say the aggressive futuristic Police hover a few mfcking inches above the ground to T-bone our brains out! Hell yeah! Who's with me? Meh...Hovers are no GRIP. They have totally different physics...And there are many of futuristic racing games filled with hovers. I dont want to see any in Grip. And im neutral about police cars. You can just PAINT your car black and white and be good with it. If Devs add "decals" and gabarit lights color customisation, you will be able to replicate police aesthetics even further. Chris_CE wrote: What's the difference between having additional race opponents and police then? Well the police isn't trying to win to race but instead to stop the player(s) by shooting and ramming. Therefore the police could be given faster cars, at least when used by AI, or they just come after you with numbers (imagine trying to lose/shoot/ram 20 cop cars while trying to avoid their attacks:O) to make more tense chases. 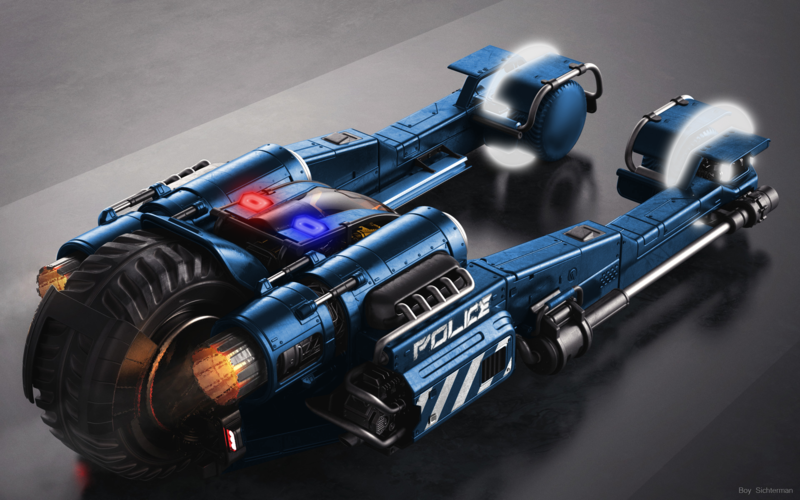 I like Sigrids idea of a police ship. Reminds me of Split/Second. once more detructible buildings and large objects get added to the game this could become very intense. Oh I like the idea it fits well the story!